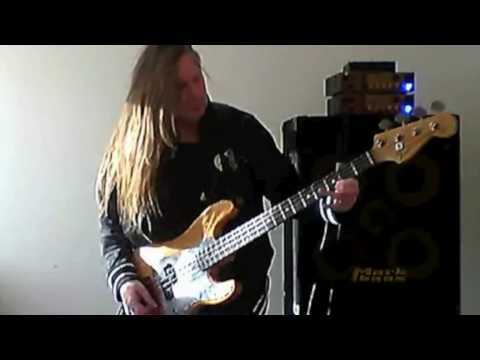 Barend Courbois is a Fun loving- High Voltage Rock, Metal, Funk and Jazz bass player who has played more then 4,000 shows and recorded on 60+ albums (and counting every month) over three decades everywhere on this planet. Barend grew up in a very musical/artistic family, including his father 'Sir' Pierre Courbois, a world-famous Jazz drummer/composer. Before he played the mighty bass, he also played drums, Indian tablas and Scottish bagpipes. Barend started playing the bass at the age of 8, playing his first show when he was 11. He studied Jazz bass guitar at the Lyceum of Music in Arnhem NL. During Barend's professional career, he has performed and recorded with a.o. Blind Guardian, Sir Pierre Courbois, Michael Lee Firkins, Timo Somers (Delain), Andy James, Adrian Vandenberg (Whitesnake), Zakk Wylde (Ozzy), Walter Trout, Eric Gales, Atma Anur (Journey), Mike Terrana (Malmsteen), Andreas Kisser (Sepultura), Bert Heerink (Vandenberg), Steve Fister (Lita Ford), Gary Barden (Michael Schenker), Doogie White (Rainbow), Donna Granti (Prince), Vengeance, Jasper van't Hof's Pili Pili, White Lion, Tank and many many more. He's won countless readers poll's awards as Best Bassplayer in the Netherlands, Best Metal Bass Player, Best All Round Bass Player in major Guitar and Bass and Music magazine's in Europe. Jaco, Stanley, Marcus, Larry Graham, Geddy Lee, Doug Wimbish, Bernard Edwards, Steve Harris, Stu Hamm, Alain Caron and his ultimate bass hero from the Netherlands Herman Deinum. "Those Little Mark Tube 800's and the Standard 104HF cabinets can handle all my styles and volume with such a huge Punch and brilliant clarity. "—says Barend—"I also love their lightweight construction... that makes my life on the road so much easier!" Barend Courbois in tour with Vinny Appice. April 13, 2018, 6:05 a.m.
On May 2018, Markbass artist BAREND COURBOIS will tour in Europe with VINNY APPICE for his MOB RULES EUROPEAN TOUR. Barend Courbois in tour with Michael Lee Firkins. March 9, 2018, 8:20 a.m.
Barend Courbois Italian Clinic Tour. July 17, 2017, 3:30 p.m.
September '17 Markbass artist Barend Courbois will have a clinic + meet&greet tour in Italy, organized in collaboration with our friends at D'Orazio Strings and Il Paese della Musica. Barend Courbois on the cover of Bass Musician Magazine May 1, 2017, 6:30 a.m.
Markbass artist Barend Courbois has been featured on the cover of Bass Musician magazine's May issue. We are happy to officially welcome BAREND COURBOIS (Bass Player Blind Guardian) into our artist family.